Interstate 295 constitutes the eastern "Bypass" of the city of Philadelphia between New Castle, Delaware and Trenton, New Jersey. The four to six lane freeway however mainly serves commuting interests through the eastern Philadelphia suburbs and the Camden vicinity. The highway parallels the New Jersey Turnpike from Deepwater north to White Horse east of Trenton. The bulk of through traffic headed north to New York City and North Jersey generally uses the Turnpike in favor of either I-95 or I-295. However both routes are still heavily traveled for interests in and around the city of Philadelphia. With Interstate 95 relocated to the Pennsylvania Turnpike east from Bristol, Pennsylvania and the Pearl Harbor Memorial Turnpike Extension to Mansfield Township, sign changes implemented in January 2018 extended I-295 west from Lawrenceville and U.S. 1 to the Scudder Falls Bridge over the Delaware River. 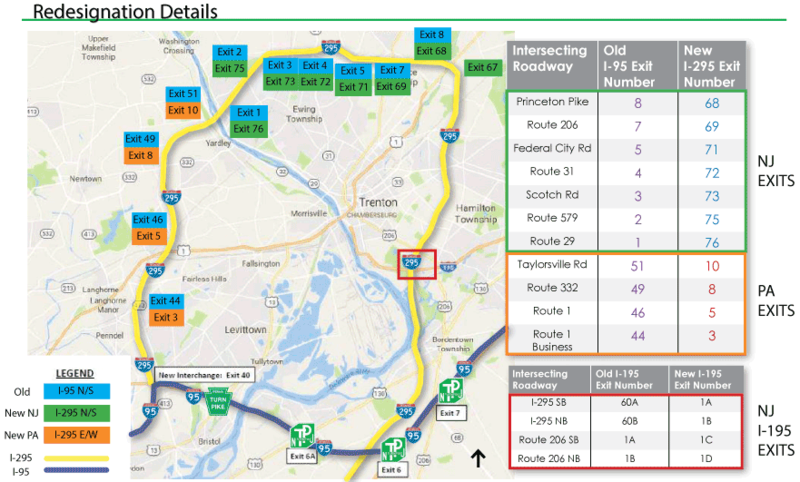 Subsequent sign changes in Spring 2018 further lengthened I-295 southwest over what was I-95 in Bucks County, Pennsylvania. Along the north Trenton belt line, signs for I-295 continue the north/south cardinal directions. Within the Keystone State, I-295 is signed as an east/west route. March 1961 - I-76 east to U.S. 30 at Barrington. 1963 - 6.6 miles from U.S. 30 at Barrington to NJ 73 in Mount Laurel township. Various improvements were completed along the freeway east of Camden in the mid-2000s, resulting in widening, reconstruction and implementation of sound barriers. A long range project addresses the exchange joining I-76, I-295 and NJ 42 (North-South Freeway) at Bellmawr. Started in March 2013 and running through Winter 2023, the four-contract project removes I-295 from the short overlap with I-76 and NJ 42, adding a new mainline above the North-South Freeway. It also adds missing ramps to join I-295 north with NJ 42 south and NJ 42 north to I-295 south. Ramps at the northern exchange between I-76 and I-295 will be redesigned as well. Details on the project at the NJDOT web page: I-295/I-76/Route 42 Direct Connection. Junction Interstate 295 & U.S. 130 shield assembly posted along Tomlin Road (CR 607) north in Greenwich township. Photo taken 06/19/00. Sloan Avenue (CR 649) east at I-295 south at Mercerville in Hamilton Township. Photo taken 09/26/09. "Trenton Complex to open." The Times (Trenton, NJ), December 22, 1994. "DOT CUTS RIBBON ON TRENTON ROADWAY NETWORK." The Star-Ledger (Newark, NJ), December 23, 1994. "A look back: Route 295." Courier-Post, April 5, 2013.